27" LED monitor features a full HD 1920 x 1080 resolution and 16:9 aspect ratio for stunning brightness and contrast whether you're working, gaming or enjoying the latest in multimedia entertainment. A MEGA dynamic contrast ratio better defines the relationship between the darkest and brightest colors to deliver an incredibly immersive experience with accurate, rich and vibrant images. VGA and DVI inputs provide flexible and convenient connectivity while a VESA-mountable design offers additional mount flexibility. 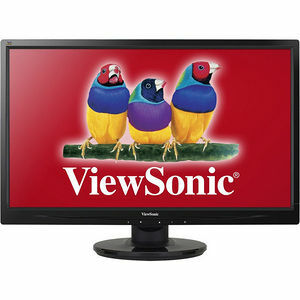 As a complete multimedia package, this monitor also includes a pair of integrated speakers. Plus, an energy-saving Eco-mode offers an excellent way to keep your operating costs to a minimum. Connectivity options include DVI (with HDCP) and VGA inputs.